I meet many clients with small gardens (yes even pokey ones) who are uncertain how to create a wonderful garden within the confines of their small space. The real challenge is how to create impact in a space within which you wish to spend more time without a sense of incarceration. 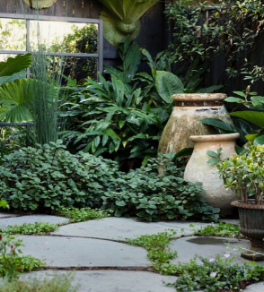 Learn more about small gardens, or courtyard gardens here. The following are my "go to" considerations for design options in small spaces. 1. CAN I 'RELAX' THE GARDEN? A small garden can become very structured and controlled by the limitations of the space. 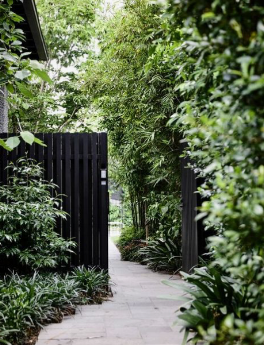 For the eye to wander through and around the garden it needs to follow "meandering" shapes and objects that contrast with the restrictive borders that are the walls and fences. 2. PROVIDE FOCAL POINTS THAT WORK WITH THE SPACE? When the garden space is very rectangular in layout, the design challenge is to create focal points at the extremities of the garden. In this example the eye is drawn to the lemon chair and surrounding plants, providing a sense of scale to the garden that would not be possible if the focal points were immediately opposite the bench seating. As this example demonstrates, planting in front or along the wall surfaces hides the garden borders that control it's dimensions. 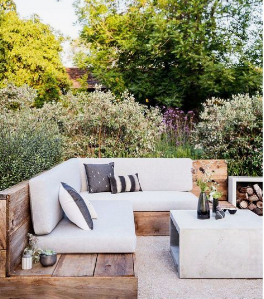 This space is so much softer as a result of a vertical interplay of softening textured plants and shrubs. A shady garden can be very inviting in a garden with a proportionate relationship between the horizontal and vertical planes. When the space is tight and narrow the balance between light and shade can be problematic. Whilst there is dappled shade in this garden, the placement and size of the trees facilitates a light filled garden room. A limited color palette within a small garden will offer a harmonious ambience that will tone down the shortcomings of a very small garden. In this example the dark color of the fence blends seamlessly with the plants, diminishing any mixed messages, visual confusion or crowding. The horizontal plane to this garden is manipulated by the level changes to the floor. Attention IS immediately directed to the fire pit and its surrounds as opposed to any concerns about the size of the overall garden. We all know that the sound of babbling water is such a tranquil element in any garden. It provides a sensory experience, whilst adding style and beauty to the garden space. A mimimal water feature can be dynamic in a small garden. With small spaces, it is not possible to include all things that make a perfect garden. If you are seeking tall trees to provide shade or screen the wind, always try to "borrow" those that are on the other side of the fence. Furniture that is light in design and in color will allow you to see further into the corners of the garden, creating the illusion of easy movement and without the need to navigate the obstacles.. When the brief calls for very contemporary elements, a ground cover like Dichondra repens is sure to impress . A green floor that does not need mowing is a winner, which in this garden is the focal point of the entire space. With so little room, functioanal multi tasking of the garden elements is a must. For example, bench seating should always be designed to facilitate under seat storage. 12. WOULD A MIRROR TO THE TRICK? Only when the mirror does not look like a mirror. The real objectives are to increase the vista and to throw some light around. An old and tired mirror will frustrate that which you are trying to achieve but if the mirror allows you to look into a "mirror image room", then its worth considering. Like to know more, contact Brian he would love to help.